Ousted Egyptian Prime Minister Hisham Qandil has been sent to Torah prison. He was overthrown by the military along with President Mohamed Morsi on July 3, 2013., a photo by Pan-African News Wire File Photos on Flickr. 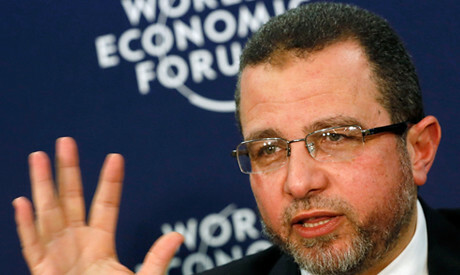 Former Prime Minister Hisham Qandil was referred Wednesday to southern Cairo's Torah Prison complex shortly following his arrest for failing to execute a court verdict, a security source told state-run news agency MENA. Qandil was arrested late Tuesday to serve a year in jail for not abiding by a 2011 court ruling ordering the re-nationalisation of the Tanta Flax and Oil Company. The lawsuit against Qandil was instigated by a number of the company’s workers. The company was privatised in 2005, when it was sold to Saudi investor Abdel-Ellah Al-Kaaky at a depreciated value, forcing hundreds of workers into retirement. In September 2011, the Administrative Court ruled against the privatisation of Tanta Flax and Oil, which Qandil failed to execute. He was appointed prime minister during ousted Islamist president Mohamed Morsi's one-year rule. Soon afterwards, a Cairo misdemeanour court upheld the ruling sentencing him to one year in prison for failure to implement the Administrative Court re-nationalisation verdict. Referred to the Torah Prison among tight security, Qandil was soon dressed in the blue inmate uniform. His arrest comes amid a security crackdown on Islamists following Morsi's ouster in July. Thousands of Muslim Brotherhood members, including the upper echelons, are detained and due to stand trial on charges of inciting violence. Morsi himself is involved in three different cases for alleged incitement to murder and conspiring with Hamas to plot against Egypt.